A news story about Blues on the Mall Concert. It was a cool evening down at Rosa Parks Circle for the last Blues on the Mall concert of the summer. 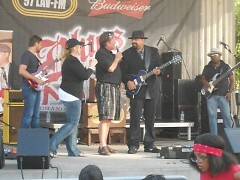 The Wayne Baker Brooks Band, from Chicago, Illinois performed on August 14. "This is our 23rd year of being the main sponsor of Blues on the Mall," says Lisa O'Callaghan, Senior Account Executive for radio station WLAV broadcasting in Grand Rapids. "We are giving out our 40th annniversary t-shirts and wings to those who want to purchase them." Vendors were also present to give concert goers the opportunity to purchase hot dogs or pop corn to eat while enjoying a nice night of blues music. "It helps our business during the summertime when the Blues on the Mall has concerts," says Kristyn Heagterg, a barista at Biggby Coffee shop located next to the Circle. "Blues on the Mall helps bring the people in to buy drinks when things are slow and then the customers go back out to enjoy the concert." 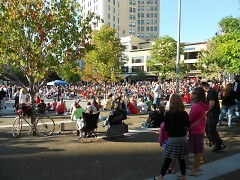 By around 6 p.m., the concert goers started showing up to find their spot and enjoy the free concert for the night. "Our first live song will go on at 6:30 p.m. on air through WLAV," says Brian Downs, Public Relations Spokesman for WLAV. "This is our 40th anniversary of being on air in the community." The concert was performed in two 90 minute sets with a break in between them. 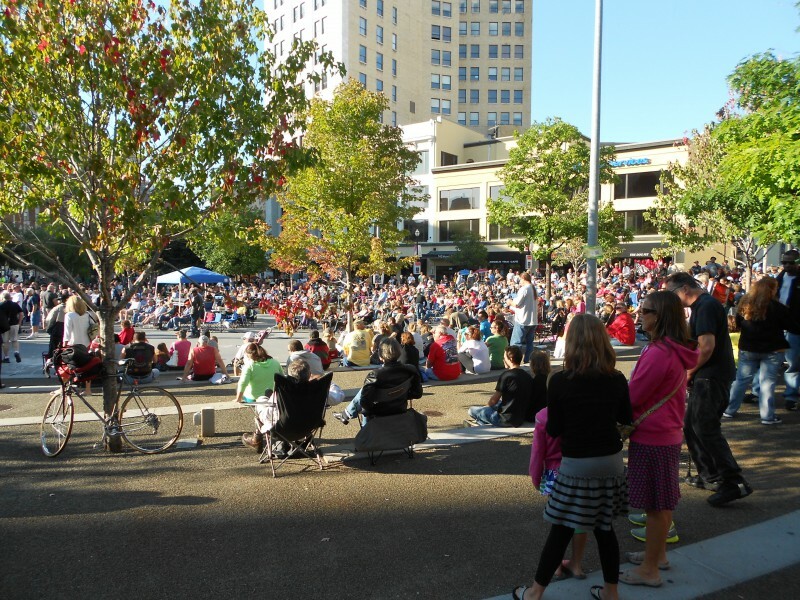 WLAV does all the booking for the bands to come and perform at Rosa Park Circle. "We've been together now as a band since 2006," says Ken Kinsey, Bass Guitar player for The Wayne Baker Brooks Band. "We're from Chicago and it was actually Wayne himself who pulled all the guys together to create this band." The band practices about three to four times before doing a concert. They practice any where from three to four hours at a time. "We've performed all over the world and my most memoriable place we've perfomered at is Southern France," says Ken. "I started playing a musical instrument in my early teens and my first instrument was the keyboard." Five guys make up the Wayne Baker Brooks Band. 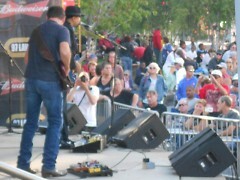 The Blues on the Mall conccert series lasts about six weeks during the summer time.